Georgetown Playfield, 750 Homer Street. 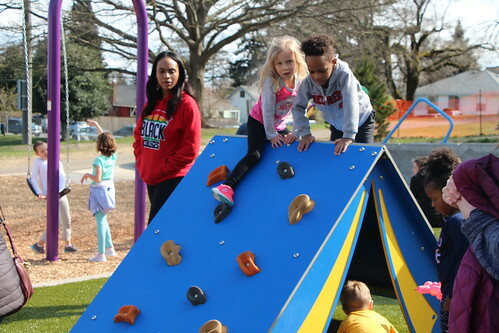 The play area renovation promotes health for all ages by providing state-of-the-art play equipment, fitness equipment, and improved pathways and playfield access. The renovated play area features an airplane-themed composite deck and rope climbing structure for children 5 to12 years old, a smart play structure for 2- to 5-years old, exciting rotating climbing play equipment, and a fun music band circle including drum, chime, and xylophones. 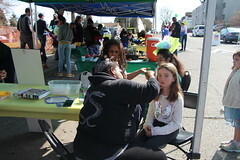 The new fitness zone, sponsored by Kaiser Permanente, provides various types of exercise equipment for teens and adults. 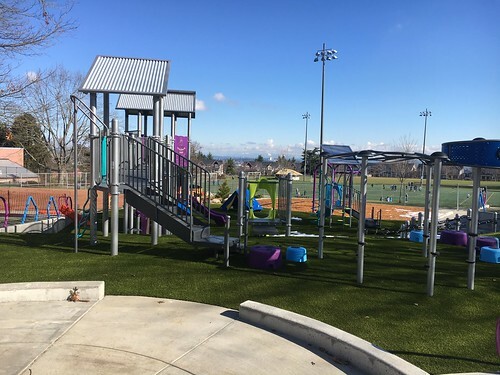 The improved picnic area creates a more inviting community space with additional picnic tables and BBQ grills. 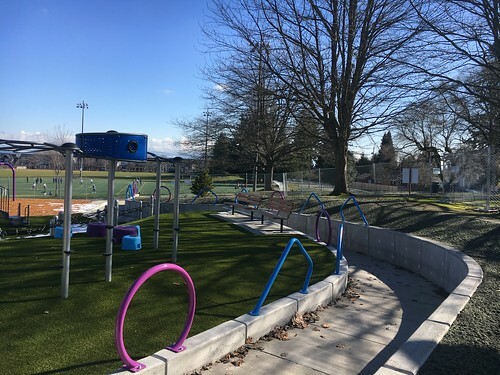 New accessible parking on S. Findlay St. and improved paths to the renovated comfort station strengthen the link between play area, spray park, picnic area and comfort station and provide improved access for all throughout the north end of the playfield. The Seattle Park District provided the funding for this play area renovation and Kaiser Permanente provided the funding for the fitness area. Georgetown is one of many communities that will receive fitness equipment and benefit from the Seattle Parks and Recreation and Kaiser Permanente partnership. 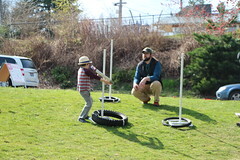 For more information about the project please visit https://www.seattle.gov/parks/about-us/current-projects/georgetown-playfield-play-area-renovation. This week, Sabey Construction will begin work to restore the Georgetown Playfield picnic shelter that was destroyed by arson last August. Sabey, which has offices in the Georgetown neighborhood, has donated all the materials and labor for the project. 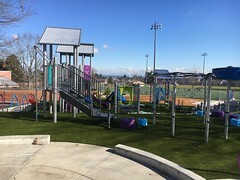 The Associated Recreation Council (ARC) was instrumental in bringing the need for a newly constructed picnic to the attention of the leadership at Sabey Construction. Working in partnership with ARC, Sabey put together a proposal for the new shelter that included enlisting the help of its suppliers and subcontractors to provide the goods and services needed to complete the project – which would have cost taxpayers more than $40,000 to replace. The picnic shelter is adjacent to the water spray feature, which opened just last summer. When it re-opens this year at the Memorial Day Weekend, visitors will be able to enjoy a picnic lunch under the newly re-constructed shelter. Sabey Corporation was founded in 1971 by David Sabey and has remained a family-owned business for more than 40 years. 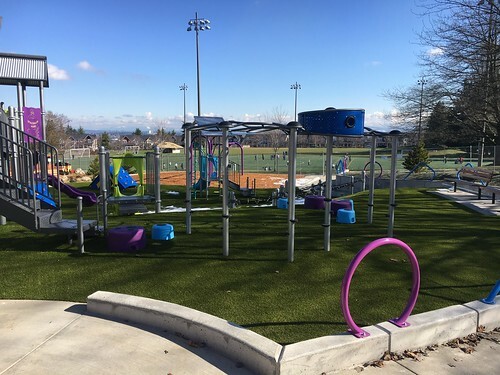 Sabey has constructed over 27,000,000 square feet of properties in the Pacific Northwest and currently owns and manages over 5,000,000 square feet of commercial properties in the region with a core principal of providing value and innovation to our customers. Sabey Corporation offers in house construction management, architecture and development expertise that are the core of the Sabey development team. This development team works with established architects and engineers, customer representatives, brokers and consultants to deliver on projects that add tremendous long term value to the customer and the community.